Abel Tesfaye known by his stage name The Weeknd born on 16th February 1990 is a Canadian singer. He dropped out of school at 17 and moved to Toronto with his friends and later he worked at American Apparel. Tesfaye anonymously uploaded several songs to YouTube under his name “The Weeknd” in 2010. He was so anonymous at that time that, his colleagues used to play his songs in workplace and they didn’t even know who Weeknd is. Here are some facts about The Weeknd by Dream Machine. If you want to know more facts about other celebs like Post Malone, Lil Uzi Vert, XXXTENTACION, Lil Pump then Click Here to read. He started smoking weed first time at the age of 11. The Weeknd was introduced to marijuana when he was 11 and then started doing harder drugs from that like MDMA, cocaine, ketamine. He lost his virginity at 16 with an older women in a college toga party. He is sober now, but to deal with anxiety he used to drink heavily before performances to get over his nerves. He thanks his good team to helping him staying away from drugs. After dropping out for a long period of time he was homeless and mentioned it many times in his songs. In a verse of his song “Tell Your Friends” Weeknd tells about his crazy life story that Weeknd and his friend Lamar robbed a guy for Jordans, but they flipped and bought some drugs and girls. Weeknd calls 2008-2010 his “Hazy Years”, he was evicted and homeless, he didn’t talk to his mother for about a year. 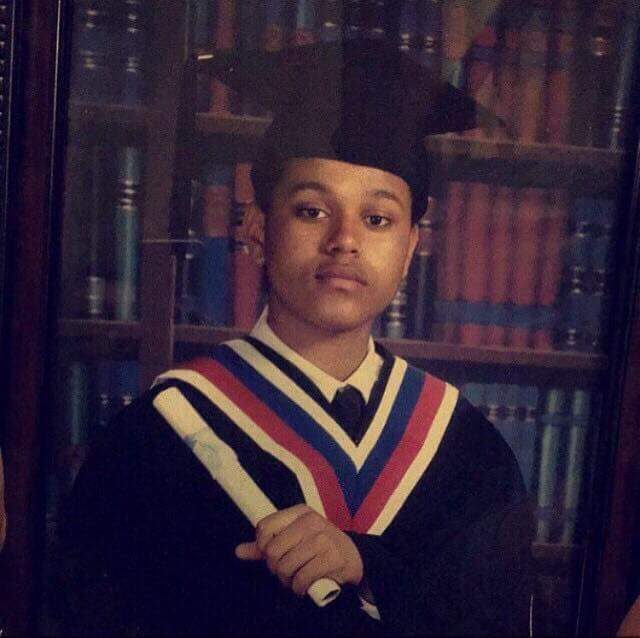 Tesfaye explained the origin of his stage name in a Reddit Q&A with fans: "I left home when I was about 17 dropped out of high school and convinced Lamar (XO crew member) to do the same lol. We grabbed our mattresses from our parents threw it in our friends van and left one weekend and never came back home... I hated my name at the time though so I tried it as a stage name. It sounded cool. I took out the "e" because there was already a Canadian band named the weekend." 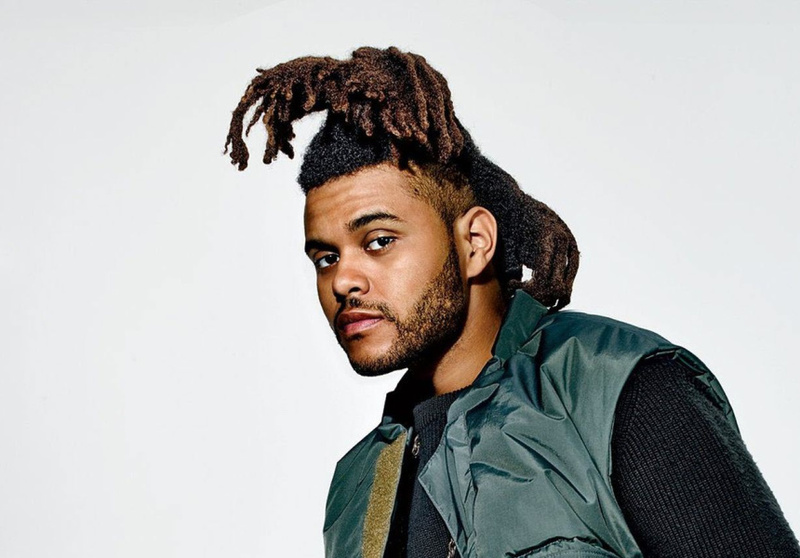 Weeknd’s hair was grown so long because he couldn’t bother with it. He wanted his hair to grow as they want until they interface with his site, and said that there is no art maintaining this hairstyle just a shampoo once in a while. He cut it for his album Starboy to give a new look to himself and he kept his hair after cutting it off. Everyone knows that XO is commonly stands for Kiss and Hug but according to sources like GQ and The TOURCH tells that the name of his record label/crew is a reference to Ecstasy and Oxycodone they’ve slogan “XO till we overdose”. Both used in recreational drug use, he also signs off his social media names with XO symbols. Even his Tee’s, Vaporizers, Caps, Lighters etc. has XO logo. You can see many of his products on his official shop site “The Weeknd Shop”. The Weeknd arrested on 10th January 2015 in Las Vegas, he was involved in a fight and police officers came to his hotel to find him at 4:20am, they started pulling Weeknd into an elevator, where he punched an officer. He was taken to jail, and later bailed. He was ordered to pay $1000 to a fund for injured police officers. Drake is been a major support of The Weeknd, He gave his half of his album to Drake, he said in an interview that “The light or Drake shined on me, he was the reason to my successful career”. Weeknd gave half of the last album “House of Balloons” (Crew Love, The Ride and Shot for Me) he had written to Drake and he returned the favor by giving him some fame. In 2013 The Weeknd released his debut album “Kiss Land”, which his fans were eagerly waiting for, and later Kiss Land debuted to number 2 and reached the top of Billboard’s R&B/Hip-Hop albums. In February 2015, Weeknd released a song “Earned It” for Fifty Shades of Grey soundtrack, which reached number 3 on charts. 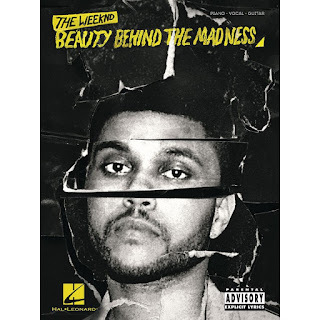 In August 2015, Weeknd released his second studio album “Beauty Behind The Madness” which reached at the top, and had two singles “The Hills” and “Can’t Feel My Face” reached number 1 as well. He got 7 nominations for Grammy in 2016 for his album and he won for Best R&B Performance for “Earned It” and won Best Urban Contemporary Album. “Earned It” also earned him an Oscar nomination for Best Original Song of the Year. Where Spotify named “Can’t Feel My Face” the official song of the summer in 2015. 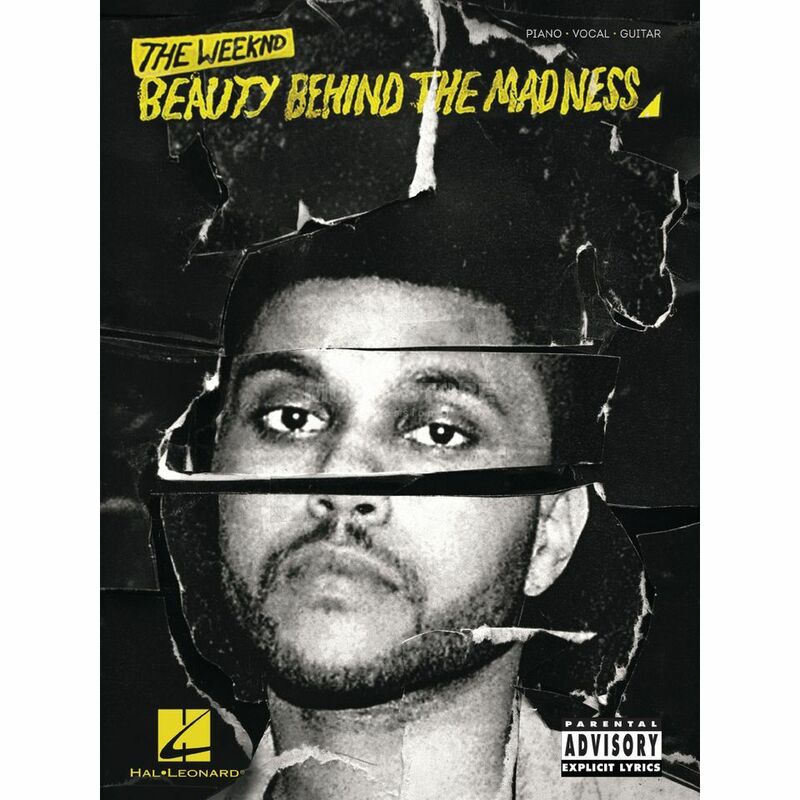 Beauty Behind The Madness was the top streamed album worldwide in 2015. The Weeknd became the first artist to claim the Top 3 spots on the Hot R&B Songs chart, with “Earned It”, “The Hills” and “Can’t Feel My Face”. Weeknd’s success story is not over yet, on November 2016 Weeknd released Starboy album. It was the 3rd biggest album of 2016 at number 1 on the charts. Where Weeknd broke the records for the most Spotify streams in 24 hours by a single artist. The Weeknd got 8 Billboard Music Awards in 2016, including Top Hot 100 Artist and Top R&B Artist. 1. 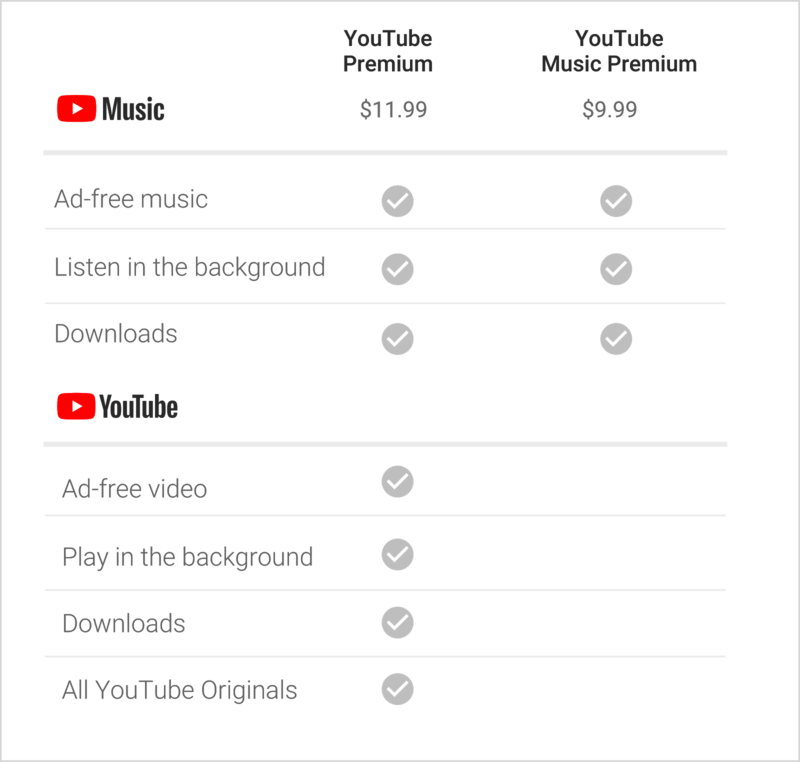 The day before yesterday Google announced YouTube Music and YouTube Premium, where users can stream music without ads for $9.99 per month or can watch it for free but with ads. 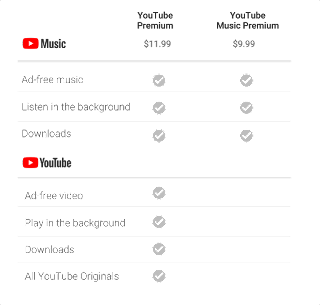 YouTube premium for original content is costing around $11.99 per month. 2. Instagram will soon show the users how much time they spent in the app. 3. Facebook adds voice posts, stories archive and cloud storage features. This update will let you save photos and videos directly to your account in the Facebook Cloud. 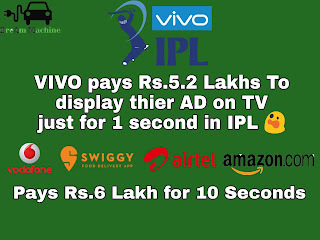 : : How Much VIVO Paid For IPL Sponsorship? The Indian Premier League (IPL) has become one of the world’s best cricket league ever. And over the decade it’s the revenues of IPL has increased from Rs.400 crore in 2008 to Rs.1,100 2017 crore, well how IPL earn so much? Actually they have many sources of income like ticket sales, partnerships, TV ads etc. And who do you support? Tell me in comment section. I truly support Mumbai Indians. Well it is not related to this Vivo, but if you haven’t read our article on “Why VEVO is the most popular company on YouTube and who owns VEVO?” Click Here to read. In 2018, IPL got sponsorship of Rs.2,200 crore by Vivo, a Chinese smartphone maker. And it has set a record in history of sports sponsorships. According to Board of Control of Cricket in India (BCCI), the amount of sponsorship is increased by 554 percent over the past contract. It had held the title rights for the 2016-17 seasons. The deal was pegged at an estimated Rs.100 crore per year. An another brand Oppo, a Chinese smartphone maker was about to give Rs.1,430 crore sponsorship, but IPL denied and caught Vivo for sponsorship which was Rs.2,200 crore five-year contract which is nothing but Rs.440 crore yearly. Each IPL match has around 2300 seconds of ad inventory which is craved out of the breaks and presentations. The title sponsor such as Vivo, commits to buying minimum 300 seconds every match, and the Vivo pays Rs.5.2 lakh per second. Smaller partners like Ceat Tyres, Dollar Bigboss, Colgate, Amul, Elica, Kent, Blue Star etc. 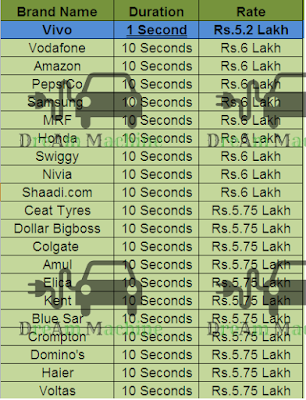 brands will pay Rs.5.75 lakhs every 10 seconds. And while spot buyers like Vodafone, Amazon, PepsiCo, Swiggy, MRF, Samsung etc. 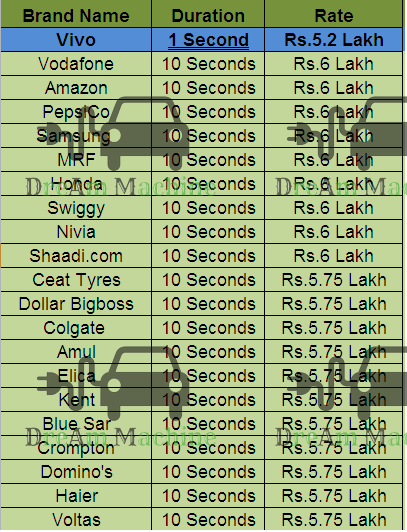 brands will pay Rs.6 lakhs every 10 seconds. That means 30 seconds ad can cost almost Rs.18 lakh for a single run during IPL game. Also, 230 ads of 10 seconds can make nearly Rs. 12 crore of revenue in a single IPL match. While with the 60 match schedule, the whole IPL makes nearly Rs.720 crore of revenue from TV Ads alone. And there are other digital sources too, that make live streaming of IPL like Airtel and Hotstar. Vivo also hold a five-year sponsorship deal with Pro-Kabaddi League (Indian Indoor Game) 2017, which is around Rs.275-300 crore. In October 2015, Vivo became the title sponsor of the IPL under two year deal, later in 2017 the deal was extended until 2022. In June 2017, Vivo reached a sponsorship deal with FIFA to become the official smartphone brand of the 2018 and 2022 FIFA World Cups. Vivo currently has a sponsorship deal with the U.S. National Basketball Association in China with Golden State Warrior player Stephan Curry endorsing brand in China and Philippines. Another deal of Vivo is with Marvel Studios, appearing in Captain America: Civil War both Captain America and Iron Man’s phone. : : Now, How Much VIVO Earn From India? Vivo Mobile India was incorporated in India in 2014 with its headquarters in Gurgaon as a subsidiary of the Hong Kong-based Multi Accord Ltd.
Vivo Mobile’s revenue of Rs.6,146 crore in 2016-17, which is a huge leap over the previous year’s revenue of Rs.1,100 crore. Consumers of smartphones are not bothered whether the phone they are buying is Chinese or American brand. The price that Vivo or Oppo sells which is around Rs.9,000 to Rs.30,000 category. All they want is phone at a price that offers good camera and other features. 1. Fitbit now has female health tacking and quick replies. This feature is available with iOS and Windows ,well Fitbit will be available for Android as well within few months. 2. In this week’s I/O developer conference, Google announced integration with Volvo cars. New Volvos will have Google Maps, app and Assistant, even if you don’t have an Android phone. 3. YouTube removed hundreds of videos that promote a homework cheating site. 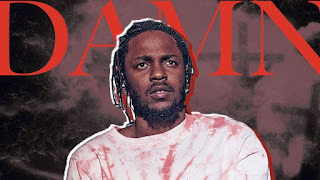 Kendrick Lamar Duckworth (June 17, 1987) is an American rapper and songwriter, who earned 11 Grammy nominations in a single year and won 7 of them. Raised in Compton, he released is first mixtape Y.N.I.C. 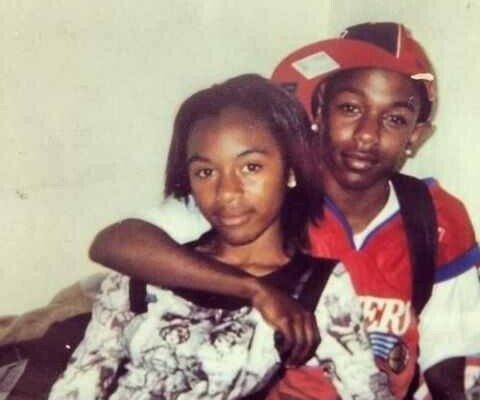 at age of 16 with his old stage name K-DOT. He began to gain attention in 2010, after his first retail release Overly Dedicated. If you havent read Lil Uzi Vert Facts then Click Here to read. If you haven't read "Facts about Post Malone, XXXTENTACION, 21 Savage, G-eazy and Lil Pump", then Click Here to read. Kendrick was an A-graded student; he was very clever in his school days. But later he started falling with bad crowd. He was involved in robberies and home invasions. Kendrick’s brother was in a gang, he served jail time for gang related crimes and according to him, his brother “wanted to be the hardest gang member”. Some of Kendrick’s friends were shot by cops. Many times officers pulled firearm on Kendrick, but he never shot by any officer. Kendrick was kind of mature boy in his teenage, that’s why his mother nicknamed him “man-man”, because he was always curious and interested in how thing works. 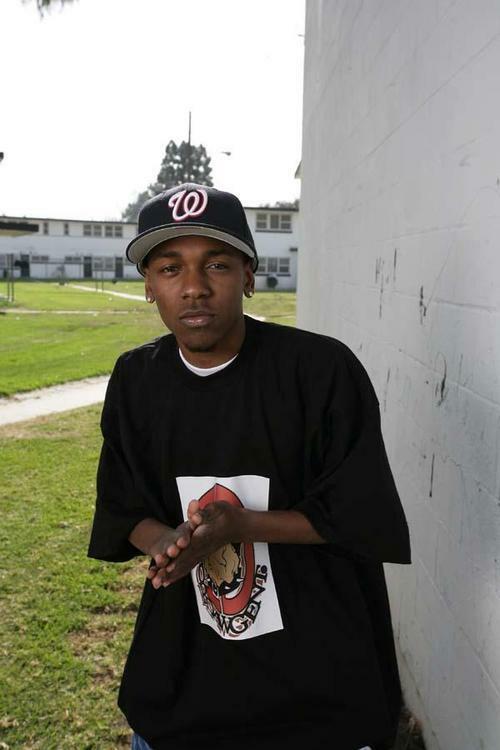 Kendrick stuttered over certain words until middle school. Because of this, he abandoned rap and decided to be a basketball player. In 7th grade his English teacher Regis Inge, introduced Kendrick to poetry. From that day he would spend his all day in his room writing verses. Kendrick’s first mixtape, Y.N.I.C. was dropped independently when he was only 16 under the name K-DOT. It gained him recognition in Compton. Nine months after its release of Good Kid, M.A.A.D. City would be certified platinum. It was the first time Kendrick was receiving Platinum Award. Kendrick earned 11 Grammy nominations for “To Pimpa Butterfly”, more than any rapper in history has earned in single year. He won 7 of them. Kendrick Lamar’s “Humble” was produced by Mike Will. Mike showed this beat to Gucci Mane, but it didn’t work out so he showed it to Kendrick instead. Kendrick wrote the song “I” to help himself combat his depression and low self-esteem, singing the chorus “I love myself” over and over again. Kendrick rapped in the official remix version of Taylor Swift’s “Bad Blood”, and he made an appearance in the music video. Taylor is big fan of Kendrick. Kendrick’s father had been part of Chicago’s infamous gangster disciples, his uncles and cousins were also involved in gang. He lost one uncle who got shot even his brother got caught many of times by cops. Kendrick’s mom and dad came to California with two plastic bags full of cloths and $500 in their pocket. Later they moved to Compton because they had family there. When they first moved, they slept in a car or park until they had enough money to get their own house. Kendrick was born shortly after. Kendrick’s dad was making money off the streets and his mom worked at McDonald’s. Later his dad joined KFC and collected some money to support their family. Kendrick was inspired to become a rapper when he was 8. His dad took him to the Compton swap meet to see Dr.Dre and TUPAC shooting “California Love”. Kendrick’s mother, Paula Oliver named him in honor of the singer Eddie Kendricks, cofoumder of The Temptations. Kendrick Lamar prefers not to read his lyrics when he goes into the studio, instead opting to recite the words from memory. Kendrick takes 30 minutes daily to meditate and asses his state of mind. He says it helps him to re-start. Kendrick Lamar strives to be a good influence on young people. He’s made several inspiring visits to various high schools across the country. Because of his young fans, he strategically writes lyrics in a way that will not encourage people to use or sell the drugs, or get involved with gang violence. Kendrick Lamar maintains a completely Drug-Free, virtually Alcohol-Free lifestyle. He’s an advocate for substance-free living for youth. Kendrick is doing very good job because all these young rappers falling into drug addictions like Lil Peep (sadly he died due to drugs), Lil Xan, Lil Pump etc. If you want to read Lil Pump Facts then Click Here. 1. Facebook may launch its smart speakers internationally. Facebook has been rumored to be working on a smart speaker since last August. 2. Instagram is rolling out a host of new features today, including video chats and redesigned Explore page. 3. Instagram will allow third parties to create custom AR filters. Instagram will debut new filters through partnership with Kylie Jenner, BuzzFeed, Ariana Grande, the NBA and other.